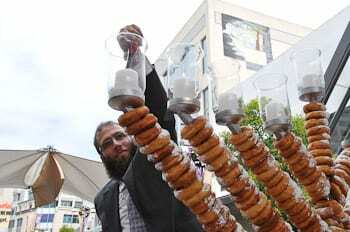 A specialist in the art of designing unusual Menorahs, Rabbi Mendel Kastel has lit the candles on his latest creation…a Menorah made from doughnuts. 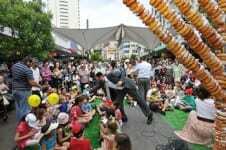 More than 500 people crammed Bondi Junction Mall outside the Carmel Cake Shop where the doughnuts were produced. 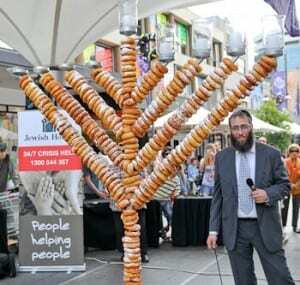 After lighting the four candles, Rabbi Kastel announced “doughnuts for all” creating a stampede towards the well-propared stand outside Carmel. State MPS Peter Debnam and Paul Pearce spoke of the important care work carried out by Rabbi Kastel, CEO of The Jewish House in Bondi. 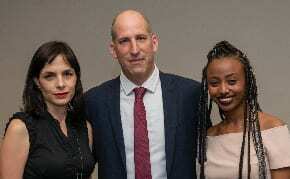 Rabbi Kastel told J-Wire: “As well as thanking our sponsors Coles and the Eastgate Shopping Centre, I have to offer special gratitude to Hanan from the Carmel Cake Shop who provided the six hundred doughnuts. It was a special afternoon and I hope all who came enjoyed themselves. 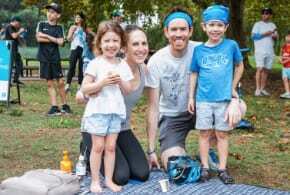 In the Past, Rabbi Kastel has created menorahs from sand on Bondi Beach and surfboards…and one year transported 20 tons of snow into Sydney’s Hyde Park to create a wintery Chanukah spirit. 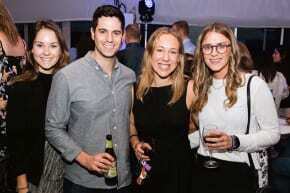 Most of the Menorah’s three hundred doughnuts were eaten. Only those which had been spoiled in the building of the Menorah were destroyed.